It's nice to see a relatively big budget zombie movie come out. This is a slick, action-packed zombie comedy or zomcom. The world has fallen to the zombie hordes and a ragtag band of survivors meet up and reluctantly become a kind of family. Woody Harrelson is awesome as Tallahassee. He has definitely been injected with an overdose of charisma at some point and he carries the film at times. Eisenberg, as Columbus, is a kind of whiny narrator. The romance between him and Wichita is predictable and dull but there are plenty of funny moments and some stylish zombie fights to keep things ticking over. The appearance of Bill Murray is the highlight of the film. 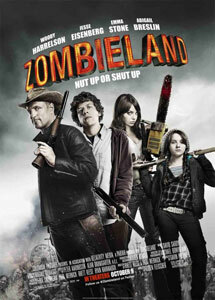 Zombieland is really enjoyable and the settings and art style are extremely reminiscent of the excellent Left 4 Dead videogame series.